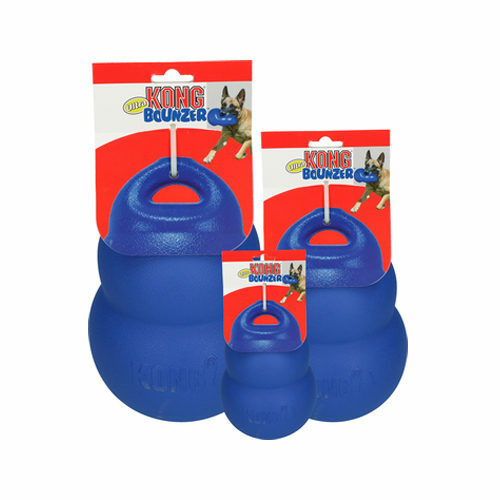 Surprise your dog with the KONG Ultra Bouncer! This cool toy is compressed when your dog chews on it. When the dog lets go of the toy, it will regain its original shape immediately. The handle makes this toy ideal for tugging and fetching games. The Ultra Bouncer from KONG is made from lightweight and flexible material. What's more, this toy comes in the familiar shape that KONG toys are known for. As soon as your dog gets hold of this toy, is it compressed and releases air. When your dog lets go of the toy, it will immediately regain its original shape. This also stimulates independent play! The Ultra Bouncer has a handle, which also makes it perfect for fetching and tugging games. Have you used KONG Ultra Bouncer before? Let us know what you think about this product.